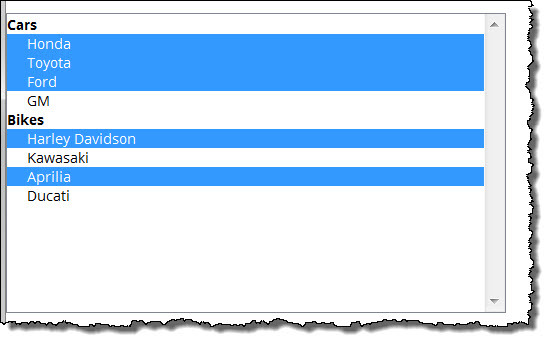 In this article I will demonstrate how to bind to the event which triggers on the completion of an XPages partialRefresh. Using that binding we will then be able to action to contents of the newly added partialRefresh DOM elements. In multiple articles I have discussed the use of the onComplete event of a programmatically triggered partialRefresh to be able to re-apply a jQuery plugin’s bindings to an area of an XPage. This works very nicely and integrates with the Dojo events controlling the xhr request to the Domino server. A problem arises when you do not have a programmatically controlled partialRefresh, say for example in a pager. XPages uses the same technology to execute a partial refresh on a viewPanel – but you and I do not have programmatic access to the onComplete event without hijacking it. This was brought back to my attention when reading Brad Balassaitis’ excellent article on adding font awesome to his data view. In that case he does not have an event available to him through the XPages designer so he has to hijack the Dojo calls. A practical solution given the tools available. In general though I have always found using the XPage events a non-elegant way of controlling the page and there has to be a better way – I think upon reflection this is a nice learning experience and “good to know” article but not practical in production. As the mozilla article states – “The practical reasons to avoid the mutation events are performance issues…...” – watching the DOM for changes every time a change happen has very processor intensive – believe me in my experiments if you latch onto DOMSubTreeModified and you are using jQuery which is constantly changing the DOM – you can easily drag your browser to its knees. If I have a simple view panel on a page and I use some jQuery to stripe the rows it looks pretty…..(yes there are other ways to stripe the rows this is just to demonstrate the point). As I am sure most of you know the partialRefresh as genius as it is, works by POST-ing the field values on the form back to the server where the JSF licecycle processes these POST-ed values and then returns a new set of HTML to the browser. That new HTML is inserted as a direct replacement of the DOM element which was being refreshed. 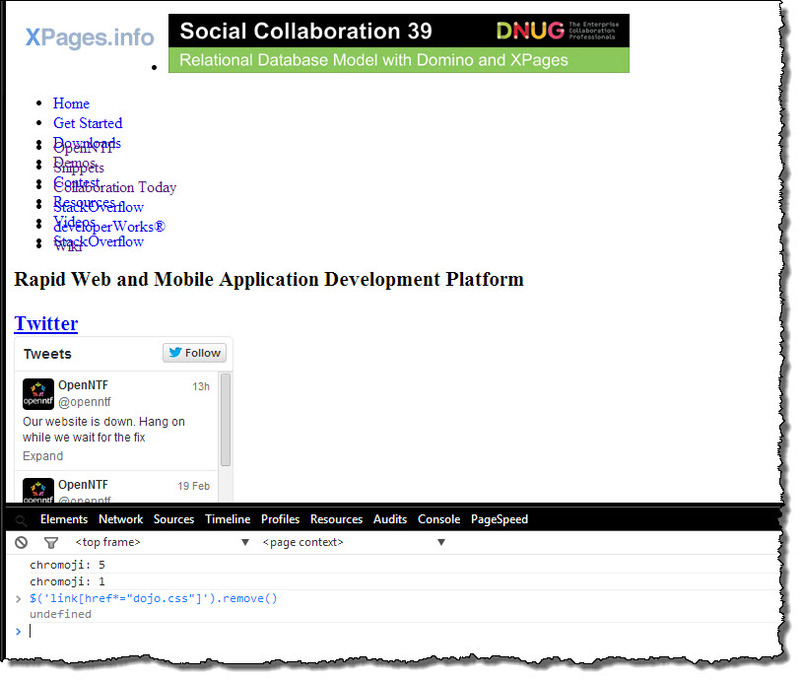 Looking at the response from the server you can see below that when paging through a viewPanel the viewPanel1_OUTER_TABLE is re-downloded from the server and replaces the existing Table element in the DOM. So my striped table is deleted from the DOM and replaced – ergo no more striping. Using the DOM Mutation event DomNodeInserted it is actually relatively easy to re-stripe the table. 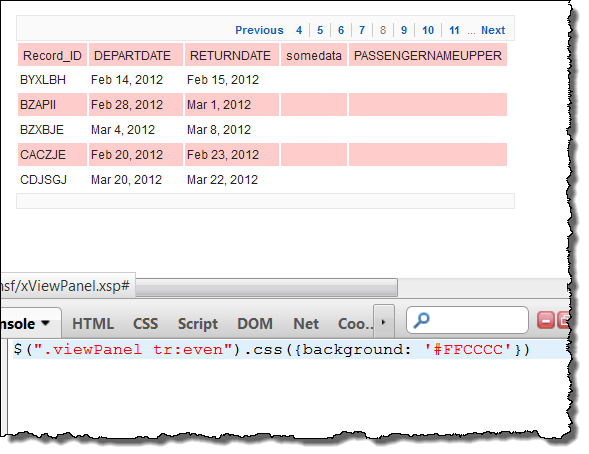 I first surrounded the viewPanel with a div wrapper “viewPanelWrapper”. This is what I will use to listen to changes for. Because the whole outer table is replaced I cannot listen to events on it – it is removed along with my binding. And that’s pretty much it – pretty simple really. So then extending this simple example you can see how a jQuery plugin could be reapplied to any page after a partialRefresh has been triggered – JUST BE AWARE THAT THERE IS A PRICE TO PAY IN PERFORMANCE. If you are going to do this then make sure that you pick the smallest area to check possible and that it does not change every second – your browsers and more importantly users will not thank you. On and applying a jQuery plugin almost certainly also modifies your DOM – be careful not to create an endless loop of pluging in your plugin. This article explains the reasoning behind the new MutationObserver and more importantly why it makes more sense than what I just showed you. Which works the same but as the article explains – WAY more efficient and also gives you the control to not screw up your plugins. Overall this has been a fascinating learning experience for me. I can’t recommend using the DOMNodeInserted event listener because it definitely caused me pain and anguish in browser performance. 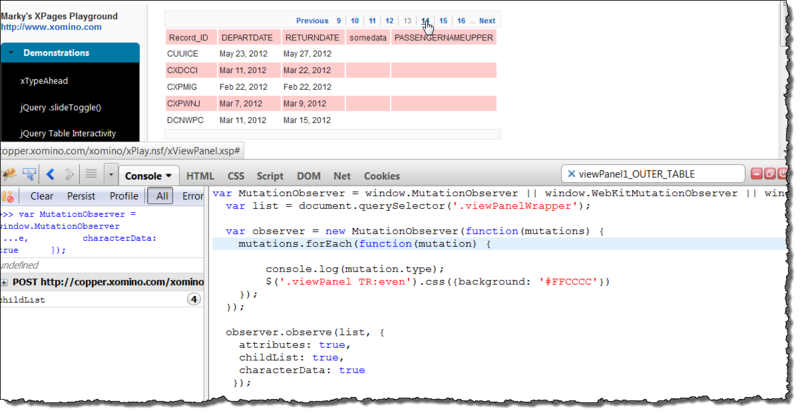 The MutationObserver is a very interesting concept but I am not convinced I would use it in an application until I better understand it. Select2 is one of the best user interface enhancers I have come across – if you do not know what it is then you need to go play with it. It transforms SELECT boxes into dynamic, stunning, interactive UI elements and allows for all sorts of customizations and developer fun. What I want to be able to do is select items from different categories within the select2 box and then add an icon displaying to the user which category they came from. In this article I will show how. And it is really pretty simple and straightforward. Since Youtube.com added their nano scroll bar at the top of the page there have been a flurry of different jQuery plugins which mimic the nano progress bar at the top of the screen. The silly thing is that the progress bar itself does nothing useful. Using NProgress you can very quickly and easily add this capability to your website for only a very small overhead to the size of your application. The reason we add this to our XPage in the manner above is because nprogress uses AMD as a possible loader (to integrate with require.js) and because of that Dojo 1.8 (on an R9 server) breaks it. On my demo page I have loaded a viewPanel with 1300 documents in it – I cannot show you more because I do not want a large database on my host’s site but rest assured if you run this up to a 5000 row viewPanel the effect is better because the refresh is slower. On the demo I have included the main example from the NProgress site and you can see that there are a number of methods for starting and manipulating the progress bar. I use start because it very nicely randomly increments itself to give that illusion of progress. <xp:eventHandler event="onclick" submit="true" refreshMode="partial" refreshId="viewwrapper"
I would suggest that if you are able to integrate with Tony McGuckin’s excellent XSnippet for intercepting dojo io events you could create an automated NProgress bar should you so chose. As web developers we have used spinners in our application for quite a number of years – this is a new twist on that concept and seems to be getting very good reviews from users. Consider integrating it into your applications. Unfortunately I cannot show you what this does my customer’s site to make it look all pretty and jQueryMobile like, but I can show you how it blows up a oneui site and you can take it from me this fixed my problem. Just add the above code in a *SCRIPT* tag within your XPage and it will remove the dojo style before it is rendered to the end user – thus they will never know. Yeah I realize this means the CSS file(s) are downloaded and then removed and I am sure there are more elegant ways to handle the issue server-side. If you ever ask me for help this will always be my first question – and a significant number of issues can be solved by just looking at the browser console and taking action based on knowing what the failure is. Problem: This means you have tried to use jQuery (most likely) before the jQuery library is loaded. jQuery plugins are dependent on the jQuery library being loaded before them in the browser. Solution: check that you are adding jQuery, the path is correct and it is being loaded before any other library dependent on it. Solution: Right click on the failing URL and open in new tab then you can see the whole URL. Check to make sure that your new design element is built. XPages will report 404 file does not exist if you have not built the new element. Even though it is in your database does not mean it is available. Problem: a lot harder to troubleshoot. You will get a message saying that the dojo.js or jQuery.min.js has reported an error and it looks like the library has a bug. Chances are though that it is a coding error or a configuration error on your part which is bubbling up as an error in the library using the code you have created. Solution: work back to the example and see where your code is different. The answer is really very simple – IBM Domino is a web server waiting for requests, and if you (or the library you are trying to use) asks the server for something it does not understand it will reject you with a 400 bad request error. In this case it is trying to interpret the _dc= command on the FiltersFeature.js file and failing. But it *must* come in your code *before* the require code otherwise it won’t work. One of last week’s challenges on the side was to take this Connections wiki page and make it readable on a small screen – if you drag the right hand side over to the left you will see that the right navigation menu overlays the non-wrapping text. The main section is forced to a 980px width ! 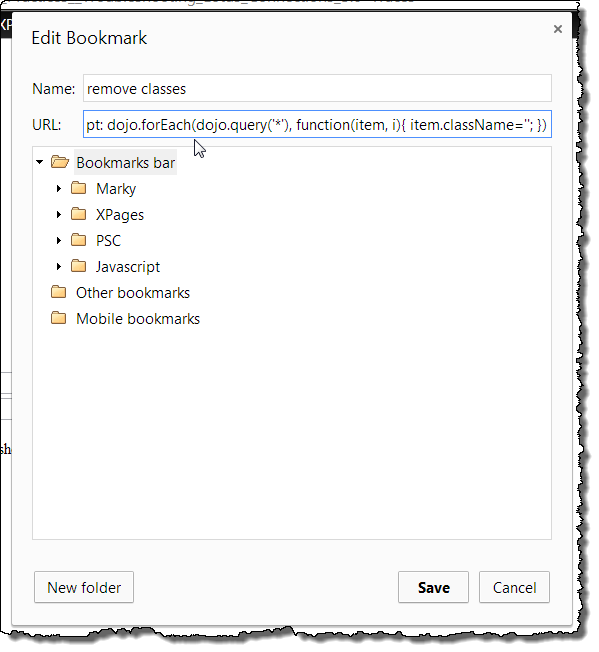 When you go to the wiki page click the bookmarklet and all classes will be removed – this is only work on pages which have dojo on them already (which IBM documentation does).